Maybe some people are confused to two different products of VeryPDF, PDF to Word Converter and PDF to Word OCR Converter. The two have two similar names. Now let us see the two applications for details and understand their difference. You see that one different point is the name. The first product PDF to Word Converter’s name does not contain an “OCR”. So the largest difference between the two applications must be something about OCR. Yes, that is correct. 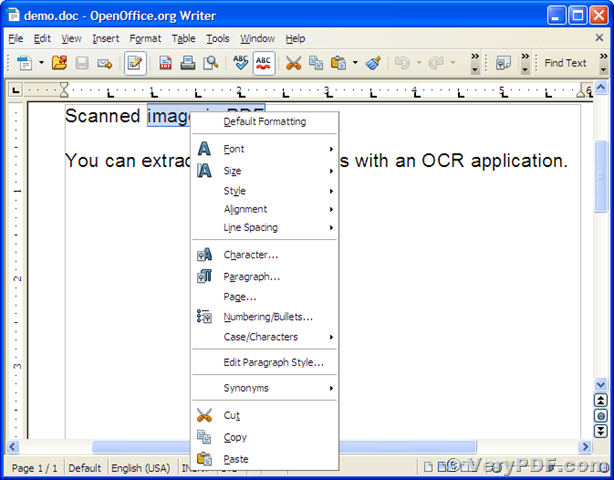 PDF to Word OCR Converter uses a technology named Optical Character Recognition (OCR). Now, what is OCR? 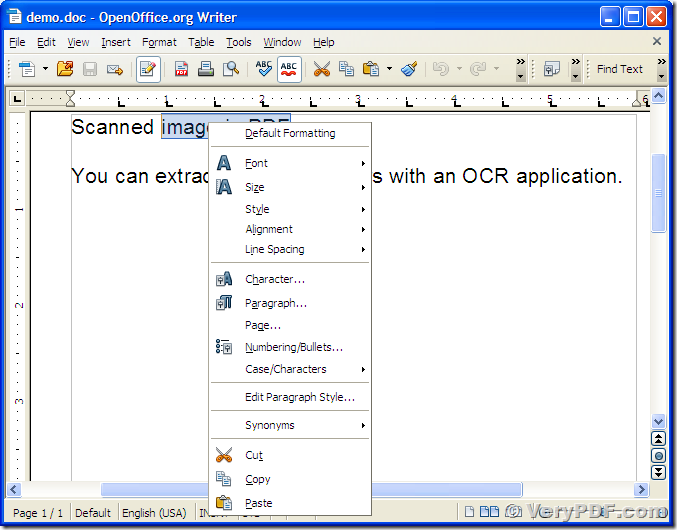 OCR is electronic conversion of scanned characters, handwritten or printed documents to machine (computer) recognizable text. This technology is quietly useful for archiving books and documents created before the digital time. An application powered by an OCR engine can recognize most characters in ordinary shapes and save them into machined encoded text. Currently, an OCR engine is always able to learn by itself, which is called machine learning. A machine learning OCR application is probably cable to recognize those characters in unordinary shapes, for example, rarely seen fonts or even handwritten types. Though, OCR tech is currently not perfect, as a successful artificial intelligence achievement, it has quietly affected our life. Taking an application named Google Goggles which is an smart mobile application developed by Google as an example, Goggles can not only search the photo taken from your phone camera, but also can recognize the characters and barcodes from your phone camera. So you can always search anything you see on Google with your smart phone. So, OCR tech is awesome. Now let us come back to the topic, the largest difference between PDF to Word Converter and PDF to Word OCR Converter. Just as the names imply, the latter is more powerful than the former because it has an OCR engine. Now come to see what PDF to Word Converter can do for us. The following snapshot is from an image PDF whose text in it is unable to be selected and copied. So, if you want to edit or grab the text in the PDF, what will you do? Yes, use PDF to Word OCR Converter. You can download PDF to Word OCR Converter from its page http://www.verypdf.com/pdf-to-word-ocr/index.html or directly from this link: http://www.verypdf.com/dl.php?file=verypdf2wordocr.exe . Then install and run it. You will see its main interface as displayed in the next screen snapshot. Drag the PDF mentioned above from your Windows Explorer window and drop it to the interface, choose OCR PDF file (Language: English) in Output Options in the interface, and then press the button Convert leaving other options as their default values. Now you will see that your image PDF with un-selectable text now is converted to editable Word. You can see that in the last snapshot that shows that the Word document is opened and editable. You see that PDF to Word OCR Converter has grabbed the text to the created Word document even with the original layouts. You can download the original demo PDF here and the converted Word document here. For PDF to Word Converter, it can only convert PDF with machine recognizable text to Word correctly. You can download the two from VeryPDF or from their webpages http://www.verypdf.com/app/pdf-to-word/index.html and http://www.verypdf.com/pdf-to-word-ocr/index.html, respectively, for free trial. This software looks good, but is it support all version of PDF formats? from Acrobat 1.1 to 1.8? Of course, VeryPDF PDF to Word is support all version of PDF formats, you can download the trial version to try it by yourself. Also, what is the limitation in the trial version of PDF to Word OCR software? can I use the trial version always? do you have a discount coupon for this product? A trial version application is only for testing the functions, and the limitations are always, for example, limited trial time, limited process file number, or limited number of pages in one file. If you need a PDF to Word conversion application, we do strongly suggest that you buy one license which is lifelong update supported. As for discount you mentioned, please keep a watchful eye on our homepage http://www.verypdf.com/, and you will immediately get informed when will do have discounts. This tool is easy to use. It can convert scanned PDF to Word correctly and quickly, thanks a lot! When I purchase your application, where can I get the registration code? After paying for it, the code will be sent to your email box automatically and immediately. Please keep the order ID which begins with letter U or E in mind, with it, we can know how to solve your matters in the future. in mind? I think just printing out or save on computer is OK. Thanks a lot. It works. I've successfully got my registration code and started to use this application. oh, this software is so great, how can i buy it, please ? there are two applications mentioned in the article, and their homepage links are provided in the article. Hi, my roommates and I want to buy PDF to Word OCR. We have 5 PCs in all. If we purchase the Multi-User Personal License (2-5 PCs), how many register codes can we get? One or five? in this situation, you will get only one license that is valid for at most 5 PCs. OCR is awesome, but can PDF to Word OCR Converter help me OCR Italian PDF to flawless Word file? Hi. That was is easy. Just choose Italian language option in "Output options"
This website seems good. Can Norwegian PDF be OCR to editable Word file? I want to know that in "PDF Password" edit box of PDF to Word OCR, which kind of password needs to be inputted? Open one or owner one? Hi, in the “PDF Password” edit box, you need to input the open password. This software can convert all the owner password protected files to word files automatically. 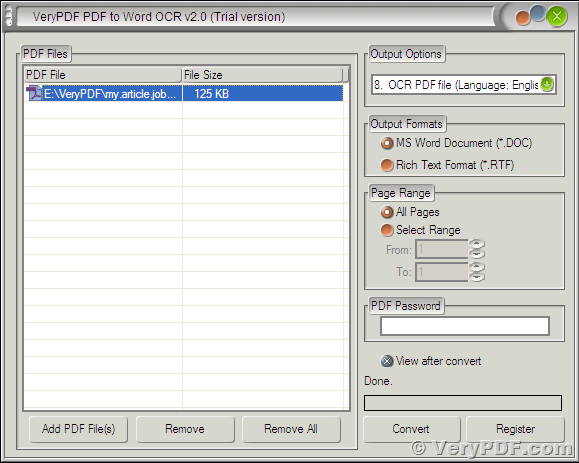 Hi, how many PDF files can PDF to Word OCR Converter process one time at most? If you use the full function version, there is no limit in the amount of added files. It can do the conversion fast and accurately.